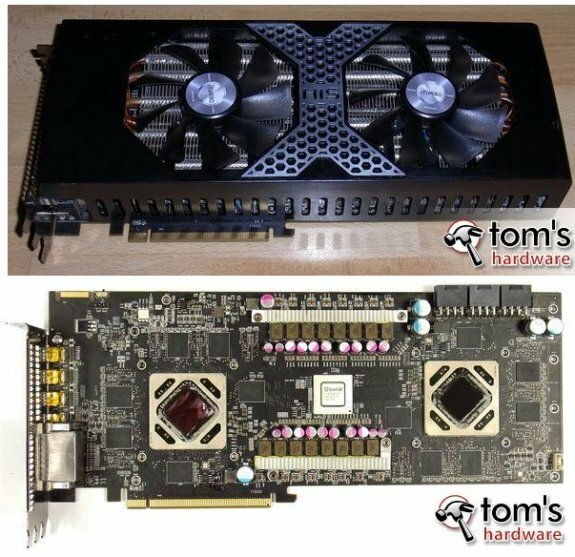 Tom's Hardware Guide got its hands on the upcoming Radeon HD 7970 X2 (aka Radeon HD 7990) from HIS. This card features two Tahiti XT GPUs, which are clocked at 1050MHz, and paired using a LocidLogix switch. The 6GB GDDR5 has a frequency of 6000MHz, and cooling is provided by a triple-slot cooling solution, with a seperate heatsink plus fan for each GPU. Pricing and availability is unknown. If you’re surprised that AMD still hasn’t launched an official Radeon HD 7990 with two GPUs, it seems you’re in good company – and we’re not referring to ourselves. Board Partner TUL has started selling its own dual-GPU design based on the Tahiti XT chip using several of its brands (PowerColor, VTX3D). Now HIS is joining the fray with its own take on the two-GPU Tahiti XT, which it calls the 7970 X2, making very sure to avoid the HD 7990 designation. At any rate, the Tom’s lab in Germany recently received just such a card a short while ago, and it bears all the markings (literally) of an engineering sample, down to the production number 007. After some back and forth with HIS, during which we provided some feedback and suggested some improvements, our German colleagues just received a revised sample – which they're already hard at work testing. As such, we’re proud to be able to say we are the first site, worldwide, to be able to check out one of these cards in the flesh and talk about its speeds and other specs.